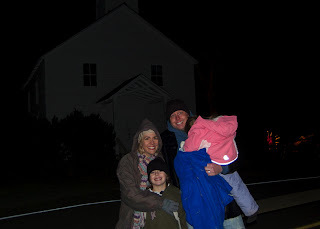 Our family arrived at the little wood-framed church, built in 1804, at 4:00 in the afternoon. It was under 30 degrees and actually warmer OUTSIDE than it was inside! We lit three small space heaters and could see our breath for a full two hours until bodies arrived and filled the little church with warmth and singing. Seven families canceled due to colds and such, and still 78 people gathered on the family night. This was a week after we had the same event for 27 college students. The night was simple. With the 200+ year old setting, we did not want ANY technical equipment, so we had some scriptures written in chalk ink on large pieces of particle board – very old school! Chunky brown and cream candles were lit, with the light aroma of spice, vanilla, and old wood… the simple manger scene on display in front. The sounds of singing, an acoustic guitar, and a djembe African drum filled the air. Two art canvases with markers lay on the floor for people to use at the end of the night. 1804 was written high on the wall above this sconce. To help people BE who they want to be, and BECOME who God wants them to become, by creating shared worship environments in which people of all ages may CONNECT and CELEBRATE with each other and with the Lord in the ways in which they are designed to naturally connect and celebrate. Did we try to get a father to see his son in a new light? No. Did we try to speak into a marriage? No. In fact, if we HAD tried to focus on ONE felt need, we would have excluded most of the people in the room. Instead, we simply got together and lifted up Jesus. He moved in the hearts of seekers, and each after-story was vastly different. People all over the building read scriptures that Mike had passed out, retelling the Story of Christ from “In the beginning…” to “the Lamb upon the Throne.” There was a quiet candlelight moment with LED candles (so not to burn down the old building! ), singing both modern and traditional music. The kids’ responses were obvious. Then before people loaded the covered wagons to take a joyride through the Festival of Lights, many took a serious moment to write on the canvases some ways that they will give much-needed face-time to Jesus during the busy Christmas season, so as not to ride through the Season without celebrating the Holy God Who became Personal. The rest of the night was filled with people wrapped up tightly in layers of blankets, sitting close, listening to laughter, carols, and the loud hums of the tractors. Ready to thaw out! Here we are after the wagon ride, Sadie fast asleep. Finally, because Cre8 is first meant to be lived out in our own personal lives (for me and for Mike to leverage our influence to help each other BE and BECOME, CONNECT and CELEBRATE…), and next in our own home (with our family doing the same for those who cross our paths)… let me share how this Cre8 Christmas gathering impacted our little family of four, within the walls of Mr. Condo. With their Cre8 Christmas Gifts, days after receiving them. That got us thinking! We also knew that he wanted his own bible (a full version and not another picture or storybook version). So, as an early surprise, we bought each child a special Cre8 Christmas Gift – something useful that will help them express what it is that they have chosen to Cre8 this year to “visit the manger.” For J. Michael, his bible will help him “sing a new song.” For Sadie, well… she wants to “be a princess” so we bought her some of the “God’s Little Princess” books to help her think about her royalty in a new light. I’m not so sure she gets the concept yet, and that’s okay. She is learning how to be giving and kind, and I’m certain that she will be singing J. Michael’s new song right along with him on Christmas Day! Well, that — AND she said that she thinks Jesus needs socks for his feet. So as the Christmas Story has taken center stage in 2010, we found a Bethlehem Village on Craigslist, and the kids have had a blast playing with it. The Justice League and some Star Wars action figures have made their way to visit the Baby Jesus! And thanks to good ol’ superglue, a Roman Centurian only lost his head momentarily, and the shepherd’s arm has been reattached, his lost sheep returned. with december 25 now eight days away and a marathon shopping day accomplished yesterday depositing bags of unwrapped gifts to be dealt with all over my bedroom floor, the few minutes spent this morning reflecting on our shared time at tanglewood has directed my attention back to the manger once again. thank you, ami! i will be prayerfully giving Jesus face-time as i wrap, bake, crochet a few gifts, and celebrate this glorious week! Thank you, Ami. I have been rushing around taking final exams, worrying about cleaning the house for a birthday party (that is happening tomorrow! ), and trying to find time to bake and shop for Christmas. Also, my daughter just lost her boyfriend and her car in a fatal accident last week, so I have been consumed with emotion for her. My stress level has definately been pretty high, and after reading your blog, I realize that I haven't taken much time lately to "visit the manger". So I will forge ahead with my plans, but with a more prayerful attitude and grateful heart. My house might not be Martha Stewart-beautiful, there may be fewer cookies to eat, and perhaps the pile of presents won't be as large this year. But through it all I will make sure that my daughter receives the full measure of my love, my son knows that he IS appreciated on his birthday, and my husband knows how much I love and appreciate him. Above all, I will reflect on the wonder and glory of God's most precious gift to us. I wish I could have been there in that little country church to worship with you, but thank you for letting us share in it through this blog. It's good to remember, especially at this time of year, that the most simple things in life are the best. Merry Christmas to you and your family, and in the words of Tiny Tim, "God bless us, everyone!" Kelly! I had to stop several times while reading your post to Mike in order to gather myself. Wow, what a season you and your family are in. I can't begin to express what an honor it is that something said in this blog today gave you some comfort. I too wish that you could be with us in person, but even in walking through the story, I feel like in a big way you WERE. Mike and I are now praying for you and your family, and especially over your daughter as she faces such extreme pain. Nothing is more important than time with each other right now. And please hold on to the peace that the same Holy Spirit Who overshadowed Mary to birth a Savior to a world in darkness, is the same Holy Spirit who will overshadow you and bring the mercy of Christ, The Healer, to you (and to her) in this dark time. You are not alone, and I pray for you a tidal wave of extraordinary PEACE this Christmas.